I recently had the pleasure of completing the PADI Sidemount Diver course with the most marvellous Mr Peter Crane. It was great fun and I was sad when the last dive was finished. This is the opposite of how I felt when trying all the same skills using a twinset! Being somewhat short in stature myself (ahem!) 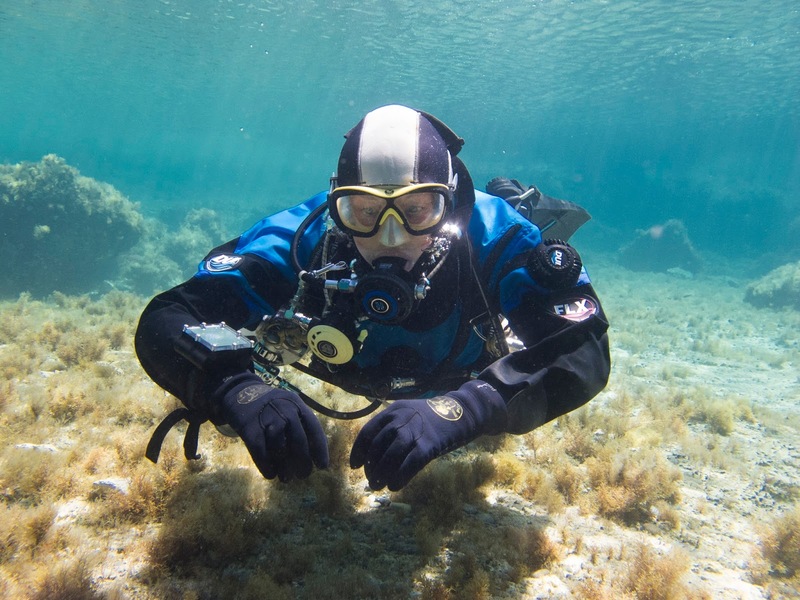 - and consequently short of arm – I struggled on a twinset with shutdowns and any other skill that involved reaching behind me and turning the cylinder vales on or off; however, with the sidemount setup it was a breeze! 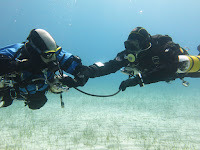 For those uninitiated in the wonders of multiple cylinder diving, sidemount involves wearing a harness-type BCD and having one, two or more cylinders clipped onto it. On my first attempt, my expert instructors had got the harness so perfectly fitted and the weights positioned so well that my trim was straight away level in the water, and I was somewhat surprised at how difficult it was initially to tilt myself upwards in order to look at the surface, or other divers just above me. 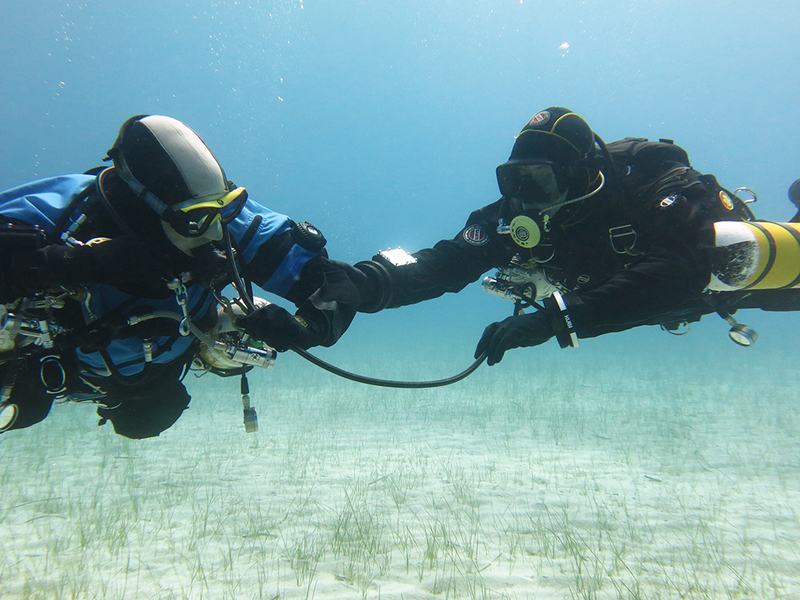 Also trying to turn round whilst in sidemount takes some manoeuvring at first - a bit like turning a cruise liner – it can be done but it takes time and practice. 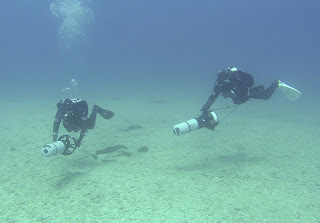 I consider the beauty of sidemount diving to be the ability to unclip the rear of each cylinder and swing them around in front of you, thus shrinking your profile in the water, reducing drag and enabling the diver to fit through slim or narrow gaps with ease – perfect for some parts of wrecks, and the caves and swim-throughs on our local shore dives here in Cyprus. Among the other benefits of sidemount was that I had two separate life support systems, so a spare for myself if one system failed, or for a buddy in case of the need to share air. I learned to swap between cylinders, breathing 30 bar from one regulator then swap to the other in order to minimise the weight imbalance due to air being used from each cylinder. Entry and exit was easy - walking into and out of the water without any cylinders attached to me was strange but liberating! All in all a very enlightening experience, and I am currently hunting down my own sidemountsetup (harness, regulators and other toys) so that I can carry on practicing my newly-discovered skills – need to find out just where exactly I am supposed to clip my camera..? I have recently arrived back in Cyprus at Scuba Tech for my third season working as a Dive master. After hearing that Pete and Shelley had recently invested in underwater scooters, I was even more excited to get back in the water. The underwater scooters are made by a manufacturer called SUEX (The Submarine Exploration Company) these scooters are one of the best DPV’s (Diver propulsion vehicles) available and are “at the very cutting edge of underwater mobility”. In the diving community they are very popular for exploring and suit all types of diving. Knowing this, I was very eager to try them! Within a couple of days, I was back in Green Bay for my first dive of the season. The conditions were excellent, the sun was shining and the water looked lovely and clear. It felt very good to be back. The design of the scooter looks very simple, yet sleek and professional. I was using the SUEX XJOY 7, a machine with two handles which makes it very easy to manoeuvre and control. On the right handle is a trigger button, which allows you to control how fast you go. Alongside this, there are two settings; high and low, which alter the speed of the scooter. To attach the scooter to you, there is a long cord with a bolt snap that attaches to the crotch D ring on your harness. 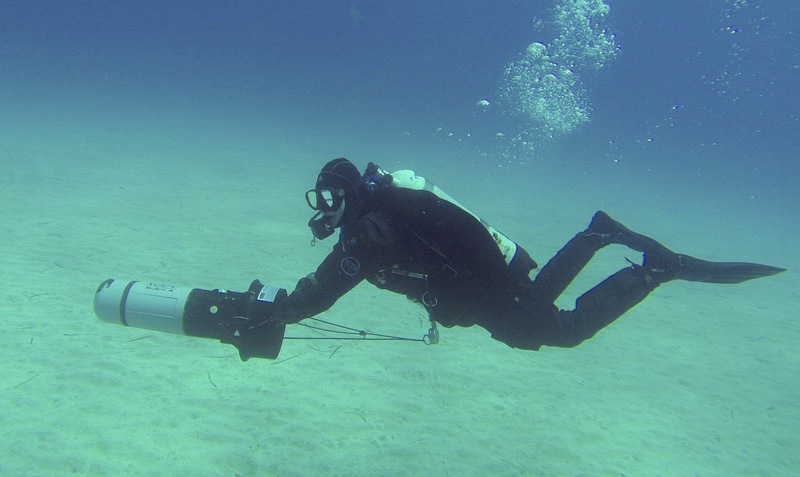 I had used a DPV in the past but it was nothing like the SUEX model. From the moment I first pulled the trigger, I knew I loved it. You can cover a lot of distance with these machines so I learned it is even more crucial to keep an eye on your buddy and stick together so you don’t get separated. You also go through your air supply a lot quicker without realising, so it is vital you keep checking and be strict with your turn around times! The dive was around the hour mark, I had my finger on the trigger for more or less the whole time. With a top speed of 55 feet a minute, these machines can go very, very quickly. It really is diving in the fast lane. According to the SUEX website, the scooters have a run time between 60 and 75 minutes. However, having mainly dived the low setting and intermittently diving in the high setting, I managed a run time of two one hour plus dives. Furthermore, in the water, the scooters are neutrally buoyant so it is very easy to stay in trim with a SUEX without having to majorly alter your weight. After having already done one dive, which was fantastic, I wanted to get out again as soon as possible and do another. I went out for an 85 minute dive with Pete and Shelley on the scooters, to one of our dive sites called The Hole. It really was awesome and I thoroughly enjoyed every minute! We covered a lot of distance in a short space of time and we saw plenty of marine life including a Ray, Moray Eels and lots and lots of Fish along the way. As I am also a technical diver, with a full twinset set up, I did wonder how the scooter would fare pulling me along throughout the dive but it presented no problems and I glided through the water effortlessly. The feeling was phenomenal. Diving without a scooter is awesome, but diving with one takes scuba diving to a whole new level.